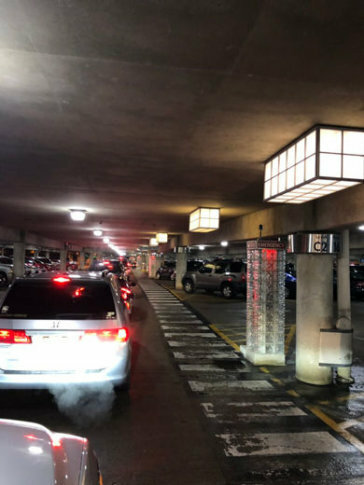 A record-breaking number of people were predicted to be traveling for the Thanksgiving holiday this year, and drivers around Reagan National were critical of the airport's effort to manage departure traffic at the end of the holiday weekend. WASHINGTON — Callers into the WTOP newsroom on Sunday night were critical of Reagan National Airport’s effort to manage Thanksgiving departure traffic at the end of the holiday weekend. Many people were unprepared for the difficulty they faced dropping loved ones off for flights home. WTOP traffic reporter Rob Stallworth started fielding calls from frustrated drivers early Sunday evening. One caller, Steve from McLean, Virginia, said it was just luck that allowed his passenger to make his flight. Callers complained that there was a bottleneck on the airport road where police were blocking the exit onto the northbound George Washington Parkway, forcing drivers to circle back along the airport road in order to exit out onto Route 1. Airports spokesman Rob Yingling, however, said he was not aware of any circumstances that would have caused police to block that exit. Tracy Vargo, of Potomac, Maryland, was dropping off his daughter for her flight back to Michigan. He said Google Maps gave them a bad estimate of how long it would take them to reach the drop-off point once they got onto airport property. He said there was no warning that the exit onto the northbound George Washington Parkway would be closed. “You don’t know it’s closed until you get to the airport return and exit split, and there’s no exit,” Vargo said. “I didn’t understand what could have been so bad that they had to close the exit onto the Parkway. This was probably my worst airport traffic experience. We left with plenty of time and we weren’t counting on that kind of back-up. After dropping her off it got worse, not better. It seems, however, that drivers who started their trip back to the D.C. area earlier in the day along Interstate 95 fared batter. Theodore and Gina Holloway were among them, heading home to Baltimore after spending time with family in North Carolina. Traffic hasn’t been a major issue, but they say they’re expecting that to change as the day goes on, and are glad to be close to home. They’re hoping to make it to Sunday service. “I’m going to church, I’m going to change my clothes now,” said Gina Holloway as she rushed into the bathroom, making it clear not even a little traffic could keep her from church. With their dog in the back seat, they plan to take him to church, too. Isaac Daniels was traveling through Maryland from South Carolina, heading back home to New York. He said he didn’t run into any traffic but left at 1 a.m. just to be safe. “I left at 1 o’clock instead of 6 o’clock like I usually do. So far, I’m almost there,” said Daniels. Although he said he’s prepared for backups once he gets closer to New York, he’s remaining hopeful it will be a quiet drive home. “I’m hoping I breeze on through once I hit the turnpike,” he said.